22nd May, Jammu: In the year 2014, due to a cloud burst, massive floods ravaged the State of Jammu & Kashmir in which numerous people lost their lives and were rendered homeless because the entire villages were swept away. IMC, through its “Relief Foundation” decided to help the people who had lost their homes and supported the initiative of building new houses for them by requesting its members to donate for the cause. The members wholeheartedly supported this noble cause and an amount of Rs 51 lakhs was collected and donated to Jammu & Kashmir Study Centre for construction of new houses. 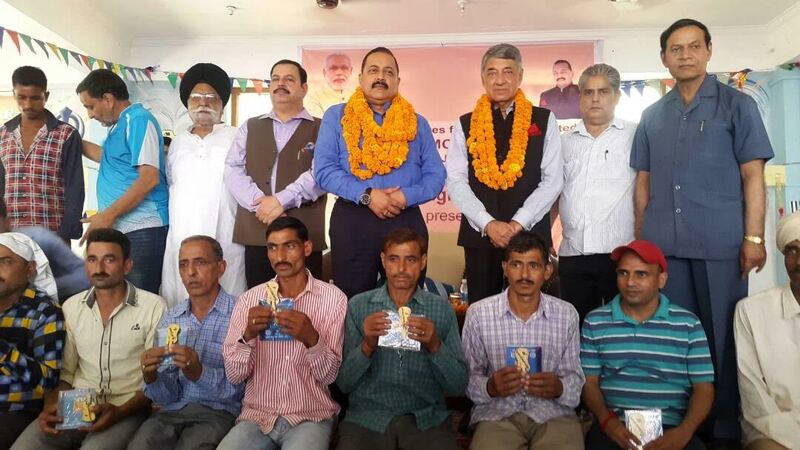 11 new houses have been built at the Seri Tanda Gaon, in Reasi district, around 63 kilometers from Jammu. These new houses were handed over to the flood affected people by Dr. Jitendra Singh, Hon’ble Union Minister of State for Atomic Energy, Space,Prime Minister Office, on Saturday,20th May 2017 at a ceremony held at Dera Baba Banda Bahadur Gurdwara in the village. The event was attended by IMC President Mr. Deepak Premnarayen and IMC Director General, Mr. Arvind Pradhan.